Happy Saturday! It’s been a busy week at work but I wanted to share some new LOFT purchases and try-ons from the past week. 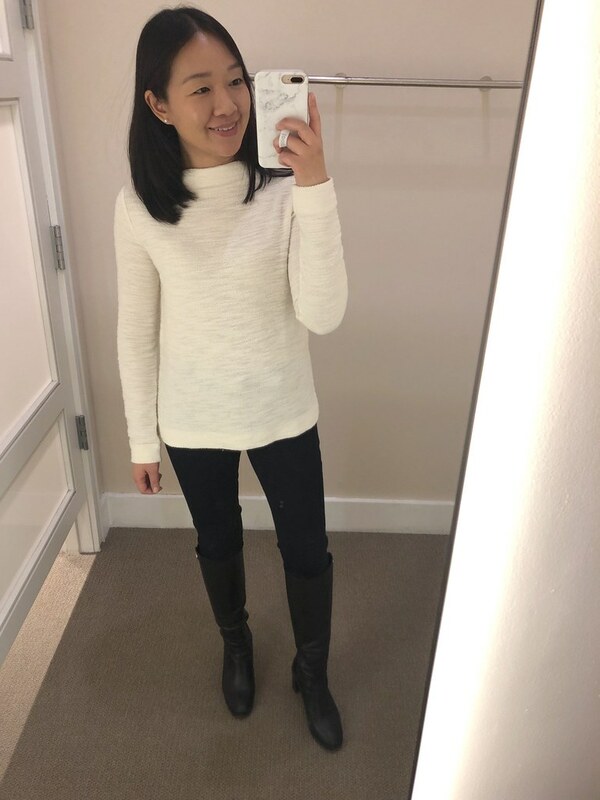 This boucle mock neck top (review below) is a sale find I got in store for $22 a few days ago. This hen tie neck blouse was one of my keepers from the previous week’s order. Thanks to my friend Lilly for enabling! I styled it a few ways below just to make sure it was a keeper. 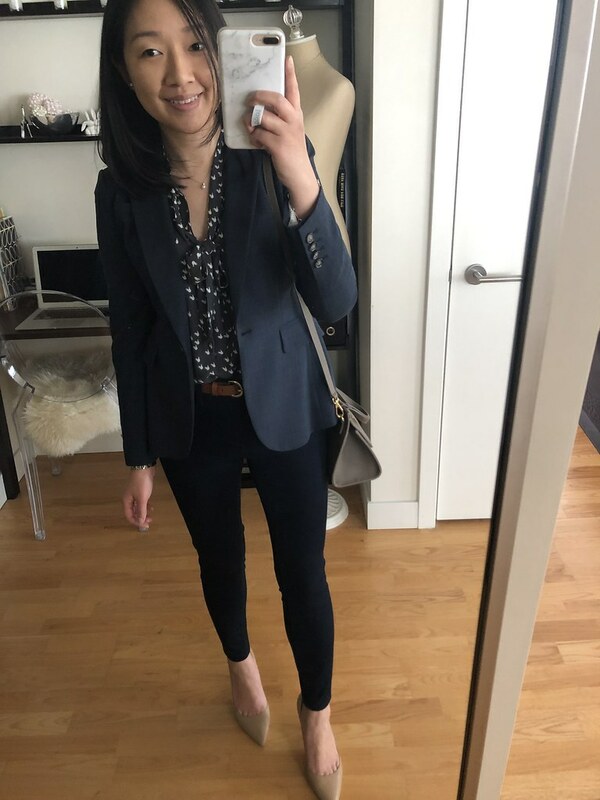 This hen print blouse is really loose and flowy untucked as seen here so I prefer wearing it tucked in and paired with a jacket or cardigan over it. The blouse runs true to size since my usual size fit me well. I rarely wear belts but I got this cognac medium leather trouser belt in case I ever need a belt. I took size XS and wear it on the second to last hole. 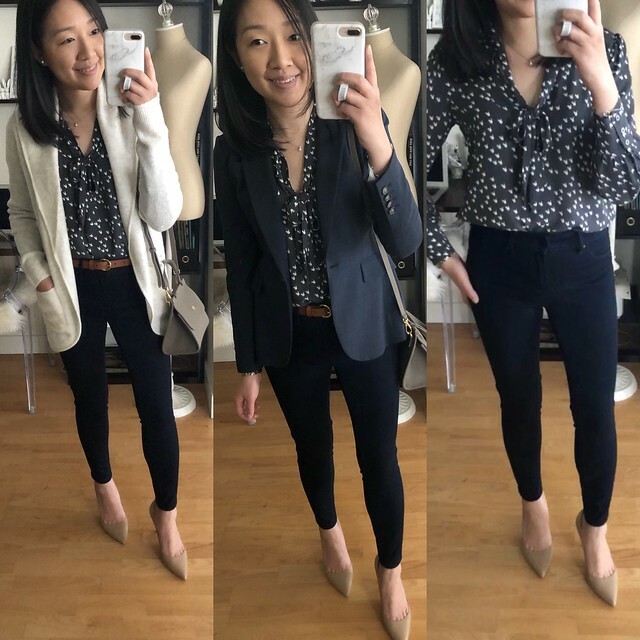 I am usually size 25/0P in pants and jeans at LOFT and Ann Taylor. 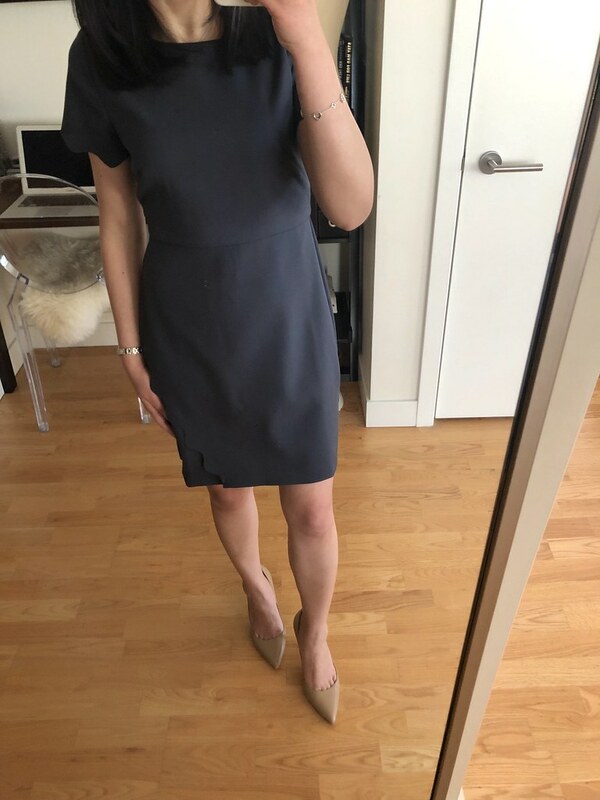 This scalloped dress runs true to size since my usual size 0P fit me well. I ordered both colors but I prefer the classic black color over the coastal grey color (below). The scallop details on the sleeves and faux wrap are a nice subtle design. Update 2/18: I returned the dress since I didn’t love the dress on me. I’m anticipating more spring new arrivals that I’ll love more coming soon. 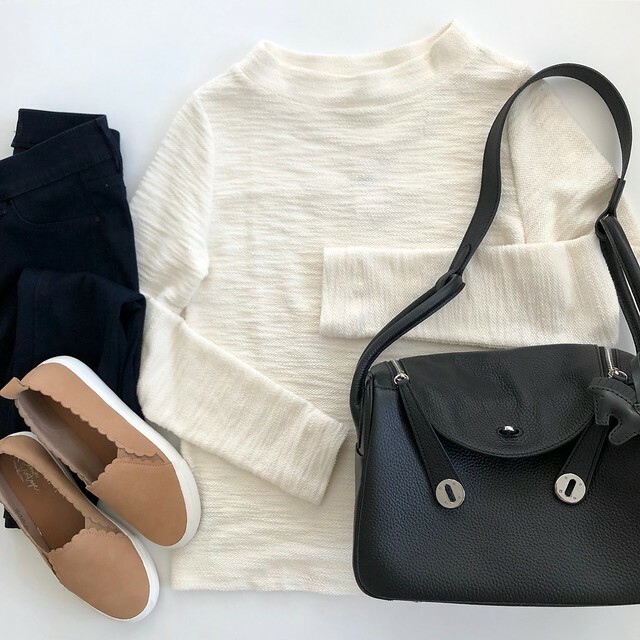 These jeans are a pull on style and they’re meant to be ankle length. I took my usual size 0P and I noticed the waist band doesn’t have a lot of stretch so if you’re curvier you may want to order a size up. I was able to pull them over my hips since I have minimal curves. I like them with my neutral pumps but here is what they look like with my Converse sneakers (true to size). The measurements for size 0P are as follows: 9″ rise, 26″ waist, 32″ hips, 24″ inseam, 11″ ankle opening. These jeans are slim through the legs and look like pixie pants on me. 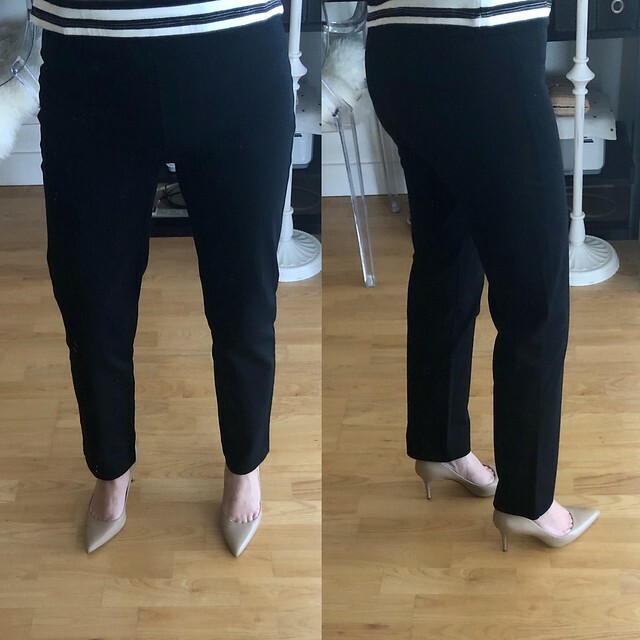 I also ordered these new pull on dress pants recommended by Shelli but since they only came in regular missy these were an awkward inseam on me. I like the seamless front of the pull on style since there’s no bumps in the front due to the lack of a button fly. The waistband doesn’t have much stretch so if you are curvier you may need to size up to pull them over your hips. Compared to the denim pair these were not as slim through the legs on me and the rise was noticeably shorter. The measurements of size 00 regular are as follows: 8.25″ rise, 28″ waist, 33″ hips, 27″ inseam, 13″ ankle opening. 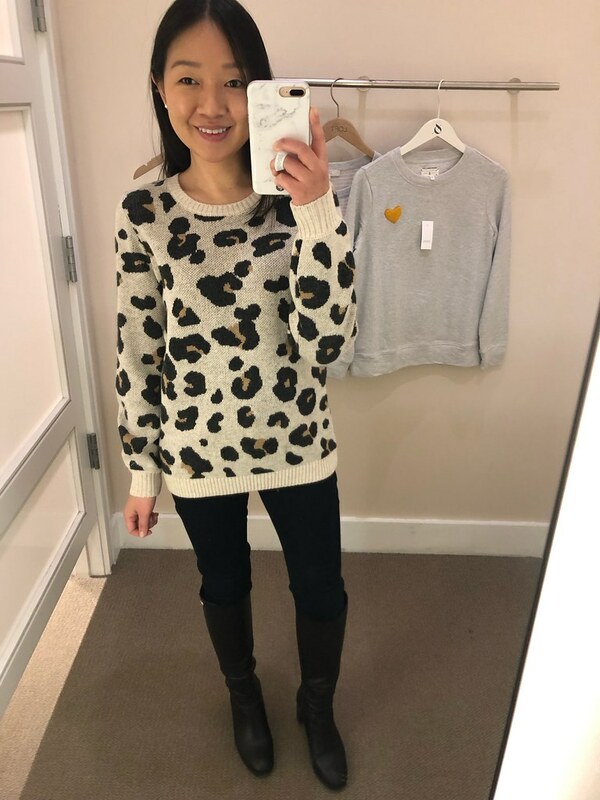 I finally had a chance to try on this popular leopard print sweater and it runs true size. It didn’t feel itchy and it was a relaxed fit and a good length on me covering my front and backside which I prefer. It’s currently sold out online but at the time I had found quite a few at my local LOFT. 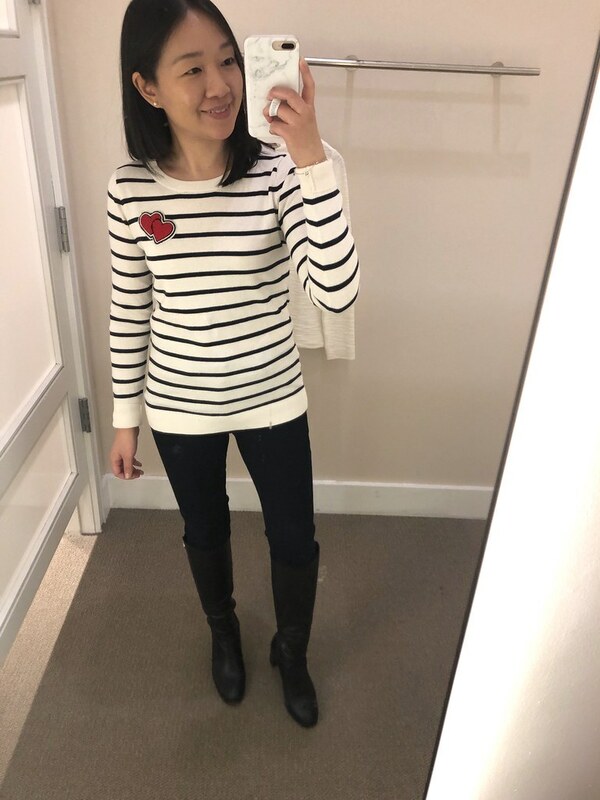 This striped sweater is really cute with the heart patches but it’s more fitted at the waist and hips than the leopard print sweater. It runs true to size but if you prefer a more relaxed fit then you may want to size up. 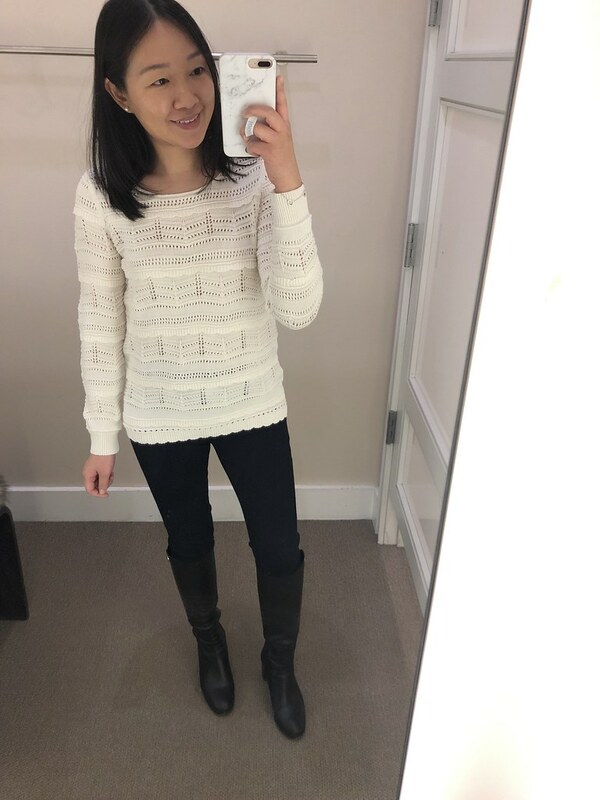 I thought this scallop sweater was really cute but the pointelle detail makes it a bit busier than I prefer. 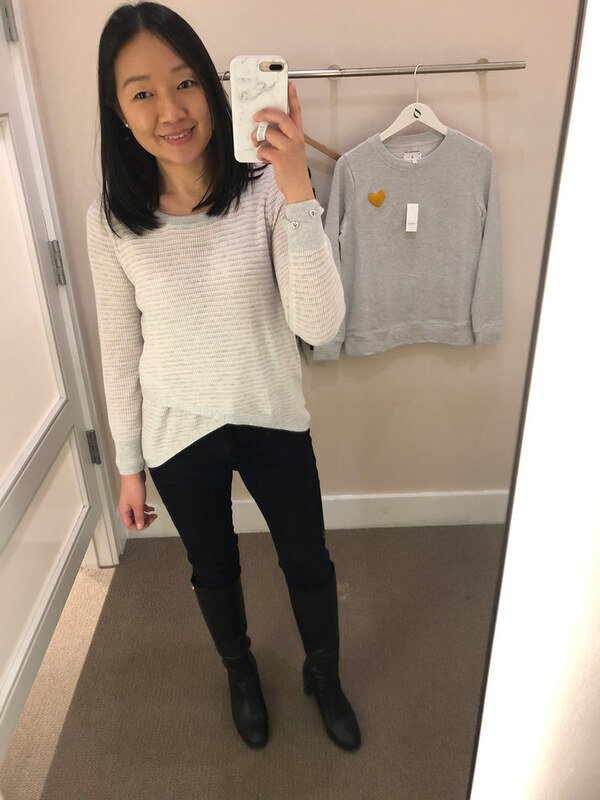 Size XS regular is a relaxed fit on me. I am not wearing a cami underneath and it was surprisingly not too see through despite the little holes all over. 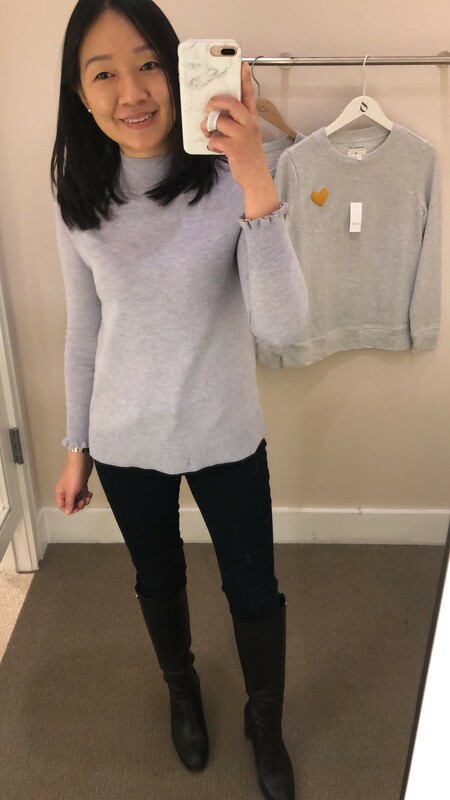 I love a good mock neck top and I found this top after checking the racks again. I took my usual size XS regular and I didn’t find it to be too sheer even though the material is thinner. I brought it home for $22. 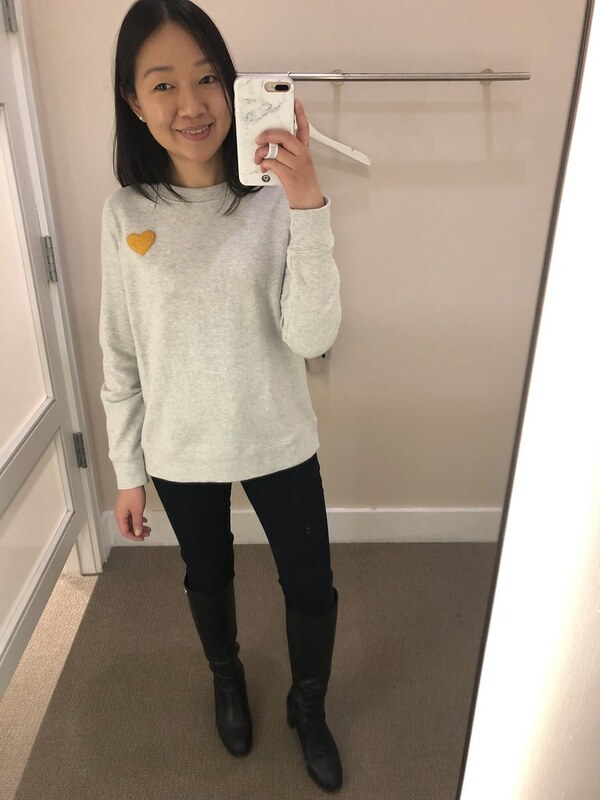 This heart patch tee is really cute with the yellow heart but size XS regular is very loose and shapeless on me. 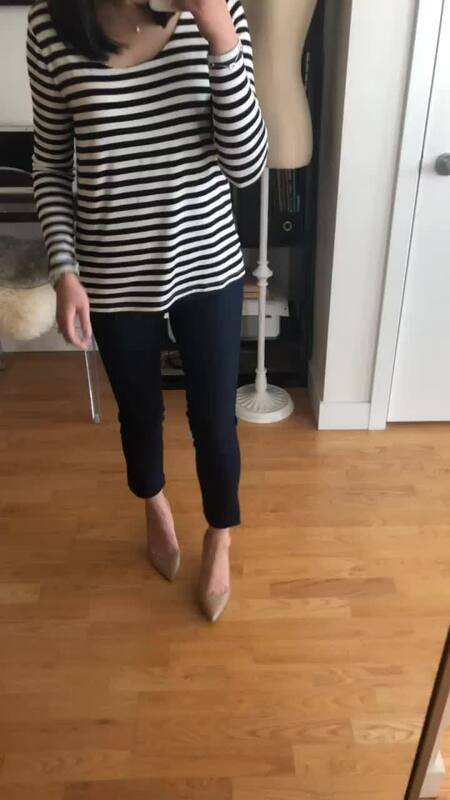 I usually love crossover tops but this one is very short in petites. If I raised my arms slightly my belly is exposed in the middle where the two hems cross over in the front. 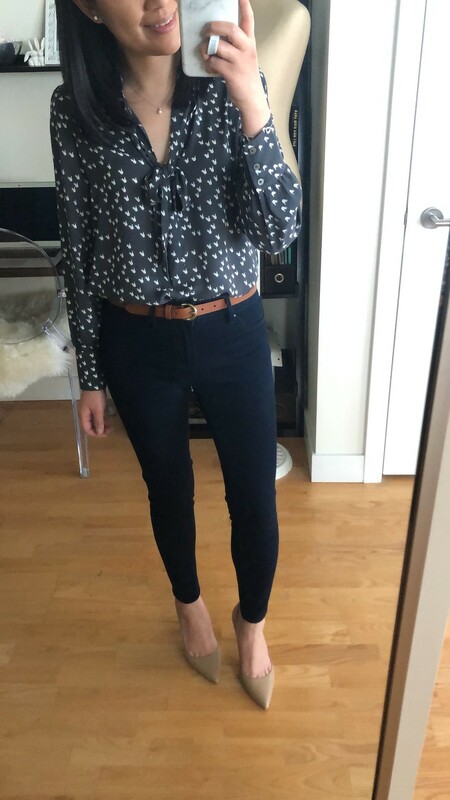 Unless you’re short-waisted I would recommend trying this top in regular missy for extra length. 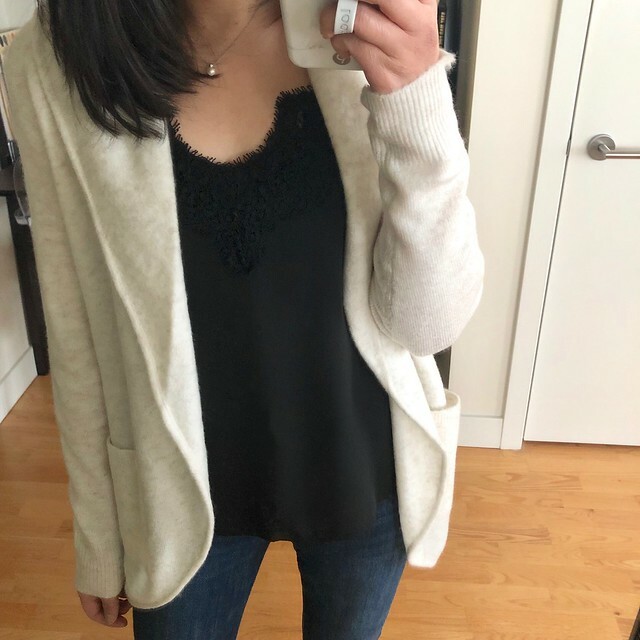 I wore this sweater this past week to work but after wearing it twice I wish I sized up to XXS regular for extra length all over. I love the color but the shorter sleeves bother me. 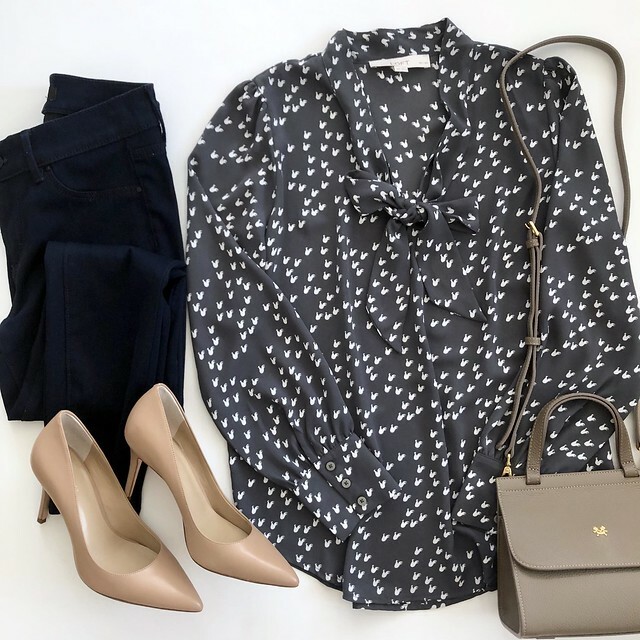 Get 40% off full-price styles (Lou & Grey styles are included too) and save an extra 50% off sale styles at LOFT. Use code LOVE. Head in-stores to shop for an extra 10% off full-price styles. Sale ends 2/4 at 3AM ET. 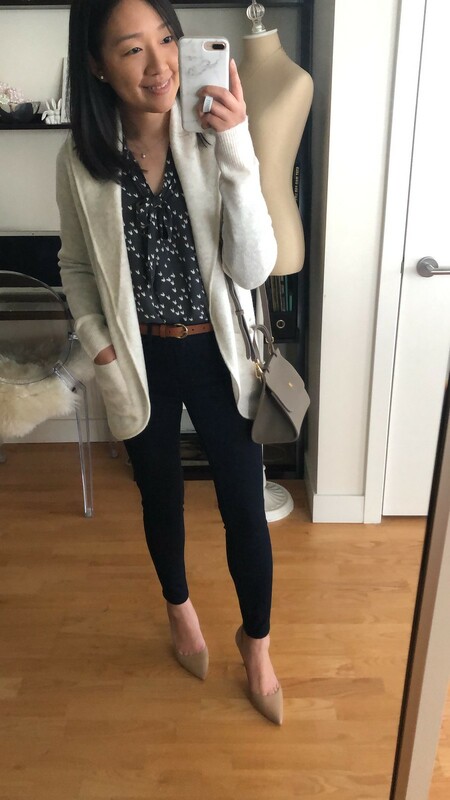 I wish I ordered this new modern trench last week but come midnight the cardmember extra 15% off didn’t work as expected at LOFT even though it worked at LOFT Outlet, Ann Taylor and Ann Taylor Factory websites. However, next time if that happens I’ll place an order anyway and then call in the morning to have Customer Service help me with the difference.